I had a dismal year on the stitching front 2012. One completed item is terrible. This year I have decided that I am only committing to a few goals. The first is to finish Just Nan's Common Ground. 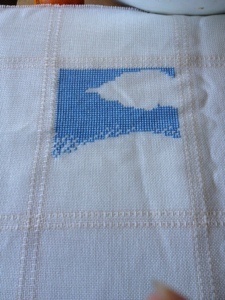 I am so close after yesterday's stitching session. I am also doing a SAL with my mate Jill (no blog). Jill and I are both hopeless when it comes to sticking to our SALs. We are doing an afghan. 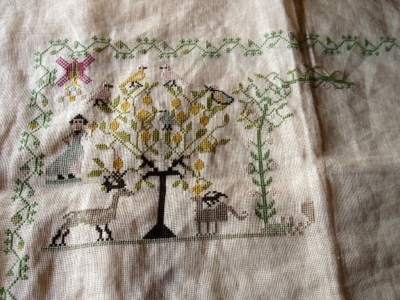 Jim Shore's Countryside afghan. I was late starting (forgot to mention it was our Jan 1st start), so needed to work out how many stitches I needed to do get the square done for January. So this SAL should take 35 months. I say should cause you never know with me. Anyways I am powering through it. I can't believe how much I am enjoying it. I am on target to having this square done. So the third goal. I want to complete at least one page of my Dutch Beauty. 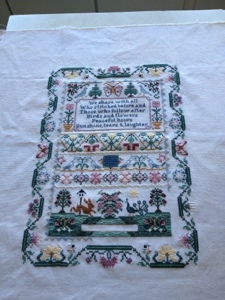 Given that I have about 20 pages to go it means it will be a long long time before I am happy dancing with this sampler. I will stitch on other designs but these ones are my goals. And then I think when CG is done I might get out Chatelaine's Mystery 2 and finish it. Gosh that was a long time ago and it is now available as Convent's Herbal Garden. I will upload a photo of the Chatelaine when I get it out. Lovely progress on you new SAL, a JN fan here too.